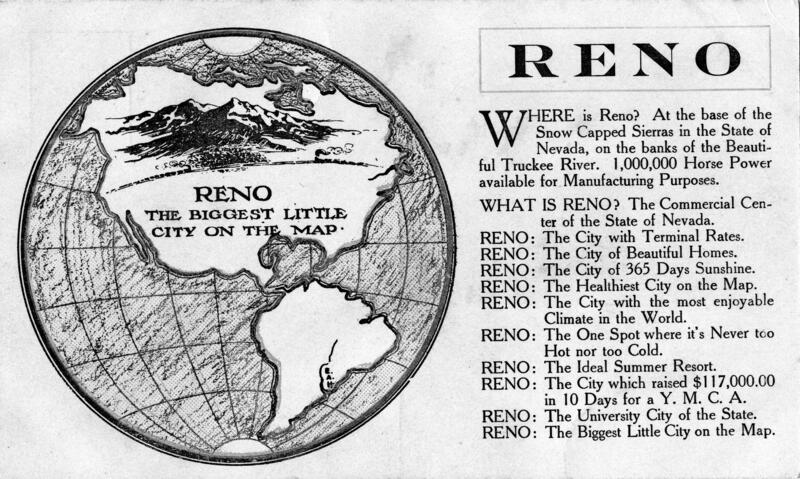 A postcard printed by city boosters named Reno “The Biggest Little City on the Map” in 1910.
Credit Special Collections Department, University of Nevada, Reno Libraries. Some cities have nicknames that everyone instantly recognizes, like The Big Apple, the Windy City, and, of course, the Biggest Little City in the World. But how did Reno’s slogan get so famous? And what does it even mean? Let's turn to professional historian Alicia Barber for our regular segment Time and Place to learn more. The answer goes back to the late 1800s, when people were flocking to major metropolitan centers like Chicago, New York, and San Francisco. In the decades after the Civil War, widely known as the “Gilded Age,” cities like these were capturing the national imagination—and much of the nation’s wealth—with their soaring skyscrapers, electric streetcars, and booming industries. 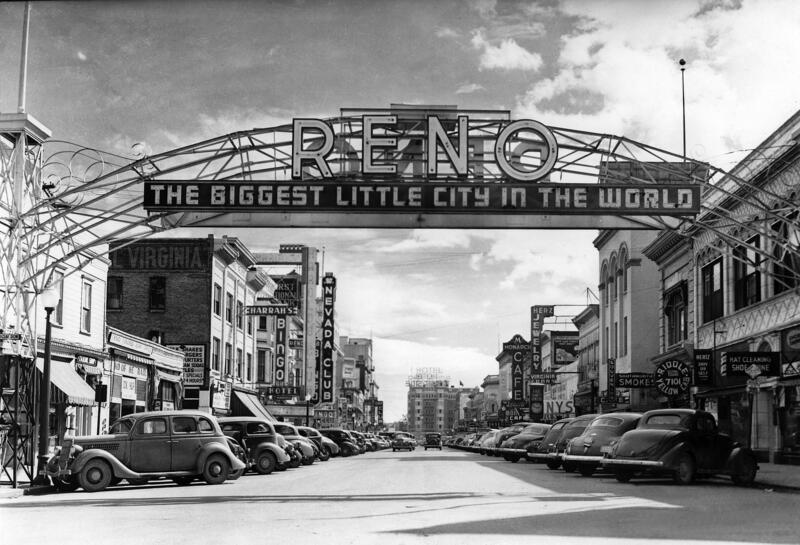 New lettering for the city’s official slogan was added to the Reno Arch in 1935. Smaller places wanted a piece of the action, too. In an effort to attract new residents—and their pocketbooks—towns across the country began to lay claim to the title of “the biggest little city” in their state, their region, or even in America. They included Wichita, Memphis, Sioux Falls-South Dakota—and Reno, which a local reporter named the “Biggest Little City on the Pacific Coast” as early as 1901. The phrase wasn’t about size so much as attitude. Our communities, they were saying, might be small, but they were big in vision, pride, and opportunities. Local businessmen promoted Reno as “The Biggest Little City on the Map” in the summer of 1910, when the heavyweight prizefighting championship between Jack Johnson and Jim Jeffries brought thousands of spectators to town. They were greeted with promotional cards featuring the slogan superimposed over a map of the world. Calling Reno a “city” in 1910 was a bit of a stretch—since the population only hovered around 10,000—but the town had an urban quality that did take many by surprise. Visitors often arrived expecting to find a backward frontier outpost and instead found a university, a charming downtown, and an air of cultural sophistication owing in no small part to the cosmopolitan crowds who were beginning to visit Reno to get a six-month divorce. The nickname caught on, and when the City held a contest in 1929 to adopt an official slogan, it was no surprise that the “Biggest Little City in the World” was the victor. The phrase was added in neon to the arch that had been installed over Virginia Street just a few years earlier. Now gracing the city’s most photographed landmark, the slogan gained even more media exposure after Nevada legalized gambling and even quicker divorces in 1931. At that point, Reno finally had the title of The Biggest Little City in the World all to itself. Political campaign paraphernalia is often seen as trash after an election, but for certain collectors, the memorabilia is a lifelong passion. Some believe political items like campaign buttons and bumper stickers are actually tangible pieces of both American history and culture. Our reporter Paul Boger, spoke with Adam Gottlieb from American Political Items Collectors about the hobby and why it's an important part of preserving the nation’s history. Photo provided to the University of Nevada Oral History Program by Mary Forson. The Second World War prompted the establishment of many new military installations throughout California and Nevada, including the Sierra Army Depot. It was built in Herlong, California in 1942 as a storage facility for ammunition. To learn more, we join professional historian Alicia Barber for this segment of Time & Place. Located about sixty miles north of Reno, Herlong became one of the destinations for Italian prisoners of war who were captured overseas by the United States and their Allies.